Leiden University exposes you to a lot of different cultures. The Dutch culture, despite being very friendly and open, can be difficult to become accustomed to. 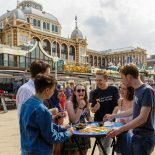 There are many ways to experience Dutch culture on your own (exploring the Netherlands and participating in student activities are two), but there are also some student groups that try to help bring Dutch and International cultures together. Can you tell us what Leiden United is about? Who does LU cater to? Leiden United is an association motivated to bridge the gap between Dutch and international (exchange) students in Leiden and The Hague. For all students interested in meeting peers from other countries and cultures, Leiden United is a great opportunity to make friends from all around the world. Besides, for international students coming to Leiden or The Hague, our association is a valuable way to meet new Dutch and international friends via our one-on-one buddy program and to learn more about your new home and the Dutch student life. For Dutch students interested in people and places abroad, our association is a relaxed way to meet new international and Dutch friends and learn more about other cultures. How did you guys form, and how have you changed since you were established? The student association Leiden United started back in 2012 as an idea to connect international and Dutch students. After winning the 2012 Cultural Interaction Initiative Competition on Internationalization and Diversity at Leiden University, the program received funding from the Van Bergen scholarship to reach its integrative goals. The first program ran in February 2013 with 100 participants: split equally between Dutch and international members. Now in its first lustrum, Leiden United has flourished into one of the biggest international student associations with a focus on integration at Leiden University. In fact, this past year, we surpassed the benchmark of 600 members of more than 60 nationalities! What type of activities does LU organise? Twice a month, the members of our association meet up with their group to dine at the exclusive and historic Dutch fraternities around Leiden: Minerva, Augustinus, Quintus, SSR and Catena. International members will be matched with a Dutch buddy based on common interests and we always kick off the semester with an Introduction Day full of activities, food, drinks and socializing for you to meet other members of the association. Furthermore, we organise various social events and activities throughout the semester. Last semester, for example, we’ve been organizing a pub crawl, a movie night in PJ’s, an animal party, a pubquiz and social drinks, a clothing swap, an international food night and a big Sinterklaas dinner in The Hague! How do people get involved? How does it work? There are two opportunities to sign up: at the beginning of the first semester and at the beginning of the second semester. We’ve just opened registration for the second semester. So if you’re open-minded, interested in meeting people from other cultures and ready to make the most of your time in Leiden, take a look at our website (www.leiden-united.com) for more information about the upcoming program and to sign up or email us at leiden.united@gmail.com if you have any questions. This entry was posted on January 19, 2017 by cameronhope51 in Cameron, Culture, ISN, Living in Holland, Student Life and tagged internationalstudent, multicultural, studyabroad, studyinholland.